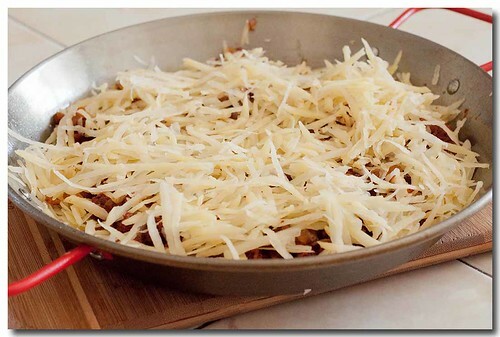 Potatoes, chorizo, mushrooms, onion and cheese baked to a golden brown. 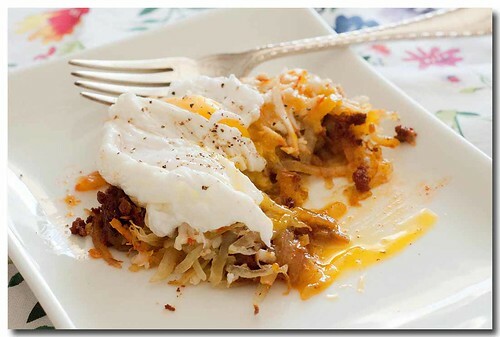 I topped mine with a poached egg. 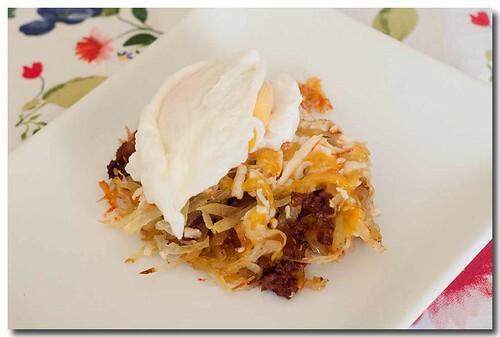 Come see how to make this delicious breakfast/brunch dish. I got the inspiration for this from Shawn, a friend of mine on alt.binaries.food newsgroup. This morning he posted a photo of his breakfast and man did it look good. 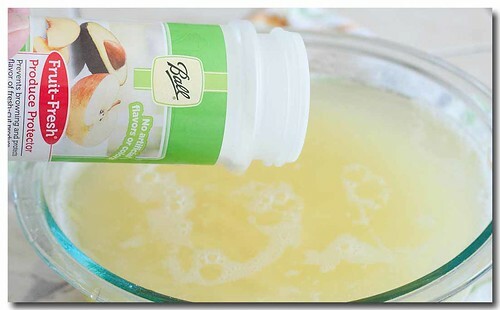 I didn't have the exact ingredients but I had similar and decided to make it with what I had on hand. Of course I had to tell him of all the substitutions I was going to make, and I hinted that It better turn out good. 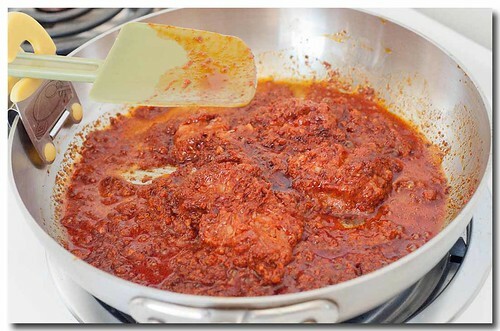 Don't you love it when someone tries a recipe of yours but makes so many substitutions that it in no way resembles your recipe at all, then wonder why it doesn't taste the same, like you intentionally left something out. 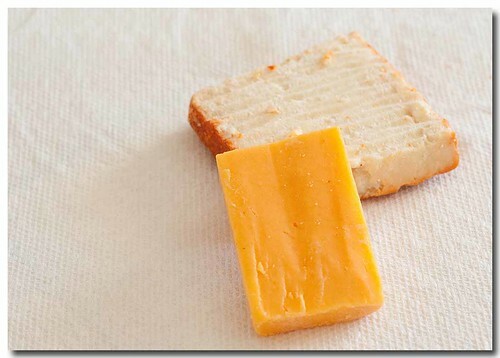 So here's my rendition of Shawn's breakfast. 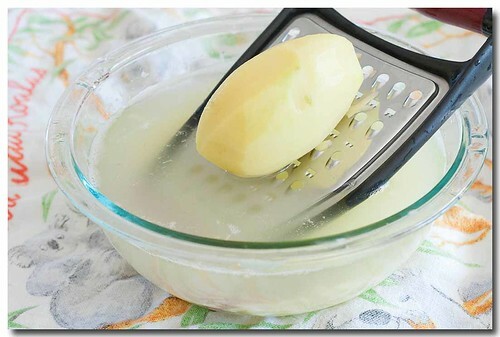 Grate 3 peeled potatoes into cold water. Because I was going to lay the potatoes out on a tea towel to dry, I hedged my bet and added some Fruit Fresh to the water to help prevent the potatoes from turning brown. 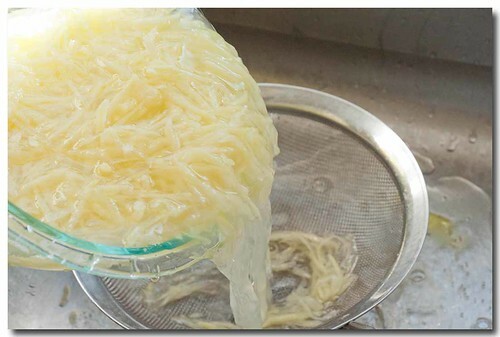 Drain the potatoes into a wire mesh strainer, or colender. 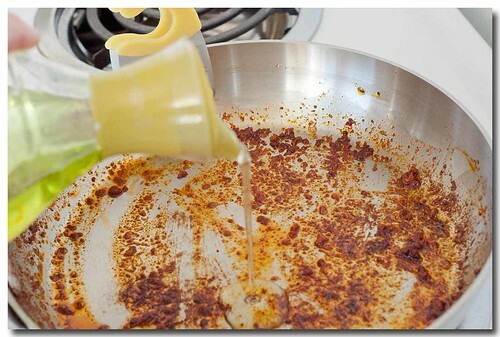 Set aside over a bowl so they can drain a little more. 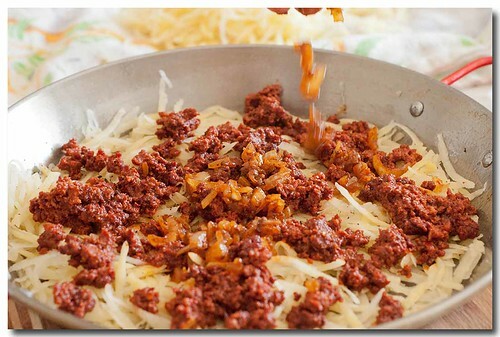 While the potatoes are draining get your breakfast meat ready. 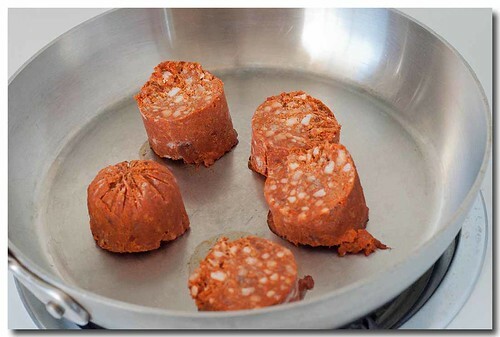 I had 3/4 of a tube of chorizo so I used that. Bacon or breakfast sausage would be good too. 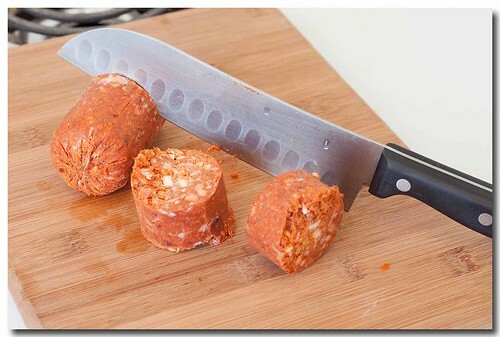 Cut the chorizo into chunks. 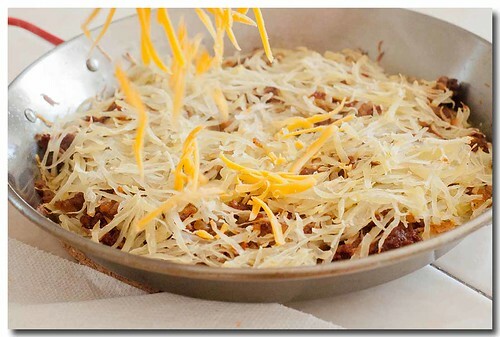 Place in a skillet to start rendering it's fat. 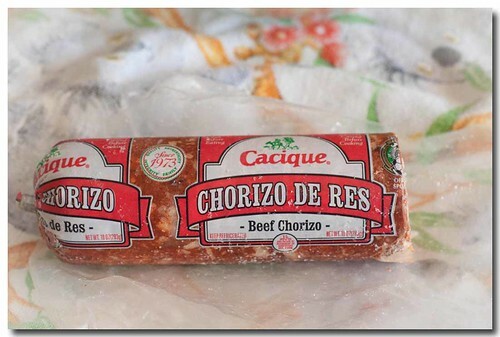 Since I don't use a lot of chorizo I keep it in the freezer. It's easy to cut off just the little bit you might need at the time. 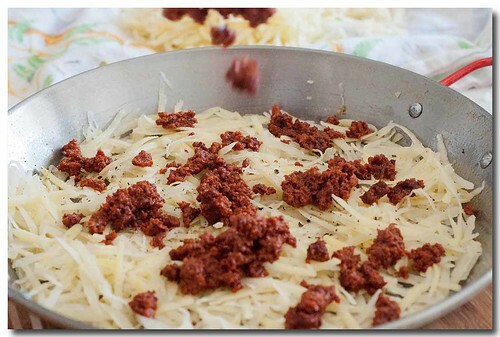 While the chorizo is cooking, spread the shredded potatoes out on a tea towel. 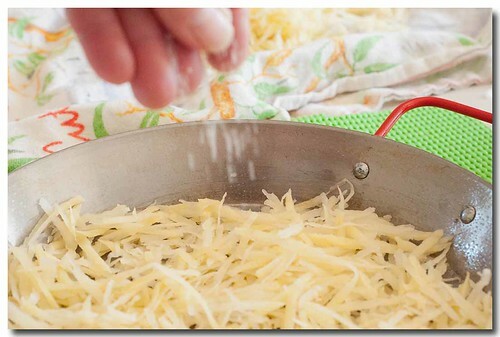 You'll want the potatoes pretty dry. 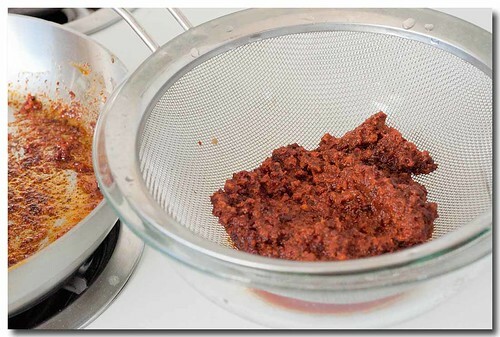 transfer the chorizo to a wire mesh strainer placed over a bowl to drain off the fat. 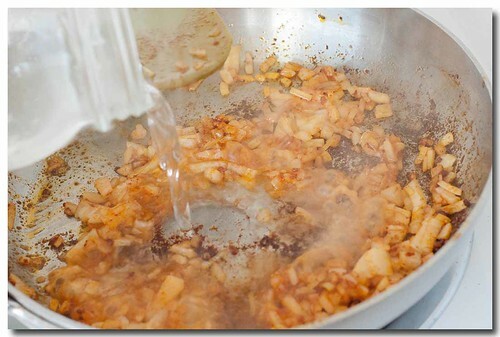 In the meantime, while the chorizo is draining, dice up half an onion. 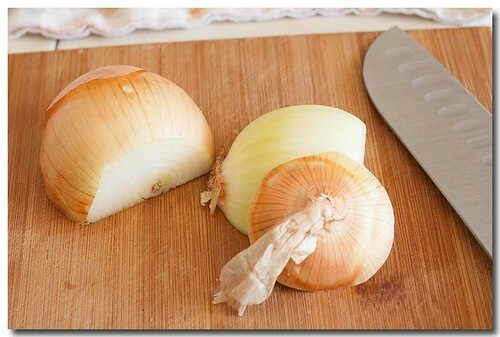 Did I tell you about the trick I learned to prevent your eyes from tearing up while slicing an onion? Well, I am now. 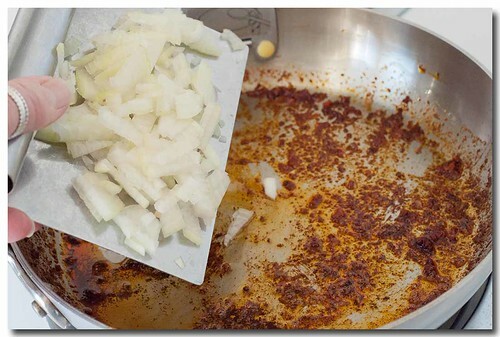 As soon as you slice off the top of the onion, put that on top of your head right away and you will not tear up while you chop, slice, or dice your onion. Right hand up, I swear. 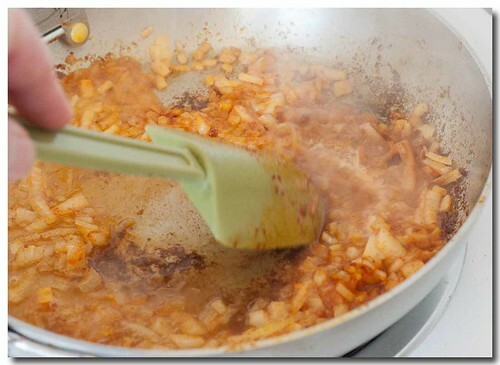 scrape up the bits of fond in the bottom of the pan. 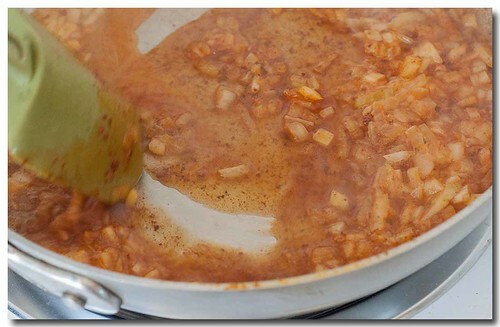 Continue cooking until the water is evaporated and the onions are cooked. This adds so much flavor to the onion. 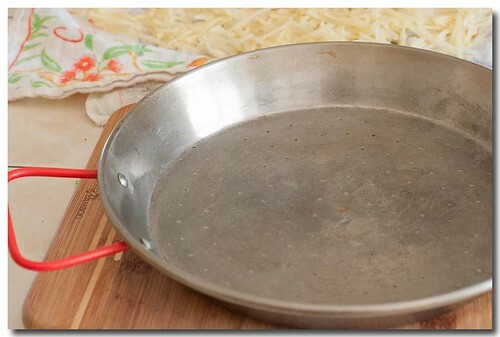 I used a 10-inch paella pan because it fits perfectly in my toaster oven. 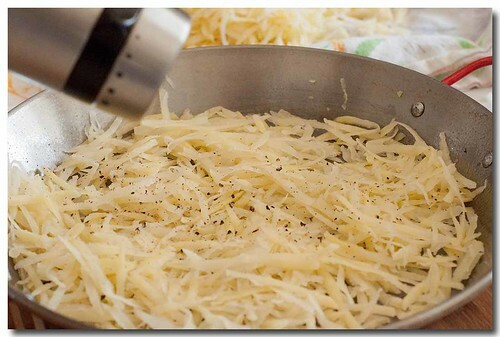 Spray the pan with non-stick spray and cover the bottom with half of the shredded potatoes. Here is where you are smarter than I am and you will remember to add some sliced sautéd mushrooms or bell pepper; or both for that matter. 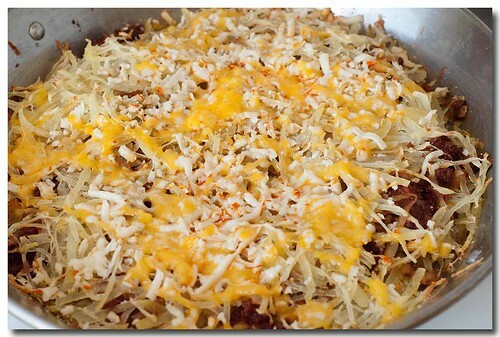 Top with the remaining shredded potatoes. Ready for the 350*f oven. 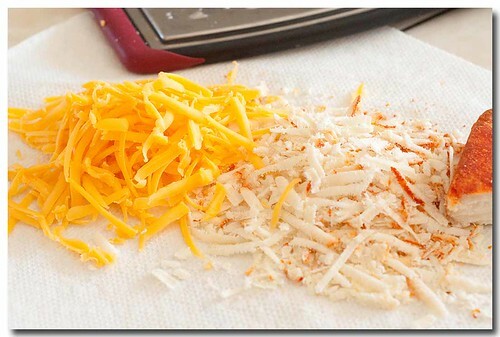 I used a couple of odds and ends pieces of cheese. 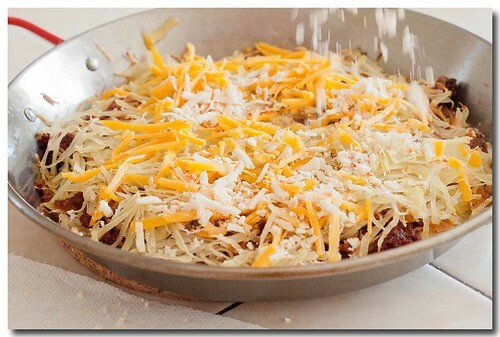 Cheddar and Queso Enchilado. About a cup of cheese total. 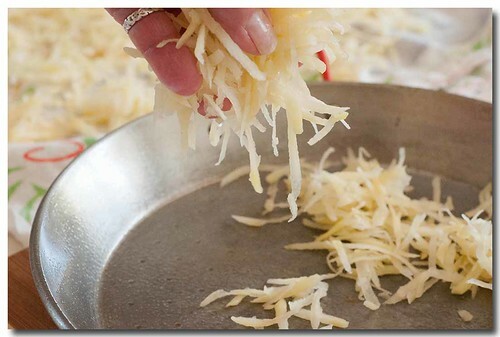 Once the potatoes are cooked, top them off with the cheese. Don't ask me why I added them one at a time, I just did. 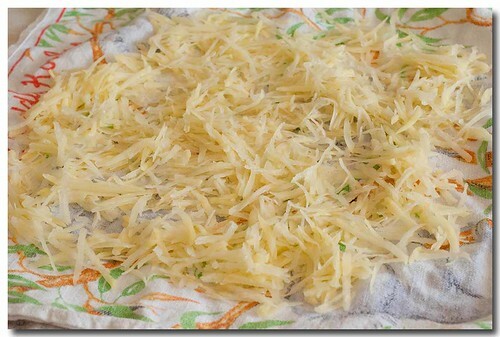 Back into the oven until the cheese is melted. 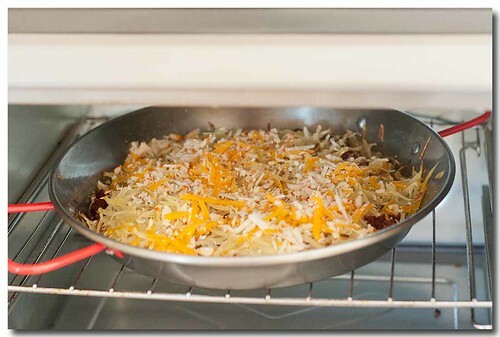 Dang, if I didn't know any better, I'd say this looks like a Minnesota hotdish. I toppped my serving with a poached egg. Absolutely wonderful. 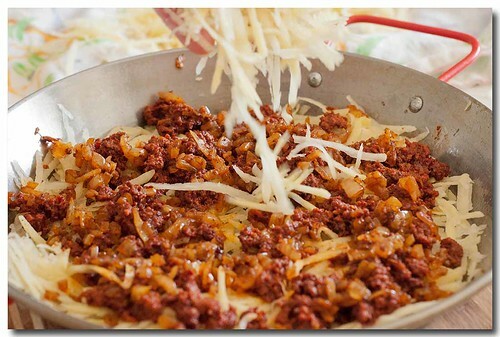 The spicy chorizo, tender potatoes, and creamy egg made for the perfect breakfast. I think this would hold up very well for a brunch buffet. Thanks Shawn for the inspiration.